The restoration of an historic building is not for the faint hearted. Regardless of size and scope the challenges faced by even the most experienced conservationist should not be underestimated. In many instances it is both a science and an art which is likely to require endless patience and considerable determination. If we are to protect and preserve the country’s built heritage, not to mention make the most of our existing housing stock, rather than relying totally on building new houses in green field sites, then restoration must be encouraged. Planning authorities and in particular local conservation officers play a key part in helping to ensure historic buildings both great and small survive particularly if there is an offer of funding from the private sector. With little or no public money available to fund any but the most high-profile restoration projects it is left to a handful of preservation trusts and private individuals to secure the future of a seemingly endless stream of properties that are added to the Buildings at Risk Register each year. In some instances consent may well be grated for temporary repair to protect a building from further decline but ultimately a permanent solution has to be found using the right materials. A recent High Court ruling has just upheld that like for like replacement means just that and a manufactured alternative cannot be used to replace natural or hand-crafted materials even if, on the face of it, it was a good match. In taking on the restoration of 7 Silverless Street in Marlborough the owner drew on nearly thirty years experience of restoring fine porcelain. Although working on a house was a rather larger project than a fine piece of Meissen or Crown Derby the philosophy was just the same. Assess the condition, examine the stability of the structure and the extent of the damage, the layers beneath that form the basis of the structure and then gradually build up the form before working on the final decoration and how this can be replicated whenever possible using traditional techniques and materials. The difference with 7 Silverless Street compared with a piece of porcelain was that is was of several build periods, each using different techniques and materials. With meticulous details the timber framing was examined together with floors, doors, plaster work, roofing and paint finished to name just a few individual elements. Then came the elements of surprise as more recent “improvements” were gently removed and in the case of the drawing room a wonderful inglenook fireplace revealed. What one sees today is the final decoration and the clever use of the introduction of new materials, such as the flooring in the kitchen, where it was found the existing floor could no longer be conserved. The result is an amazing house, fit for the 21st century with true reverence to the past. The combination of such fine attention to detail as one might find using a 000 brush on an antique vase coupled with endless patience has been well rewarded. 7 Silverless Street is a wonderful example of a domestic building that has survived against the odds and now has a bright future. 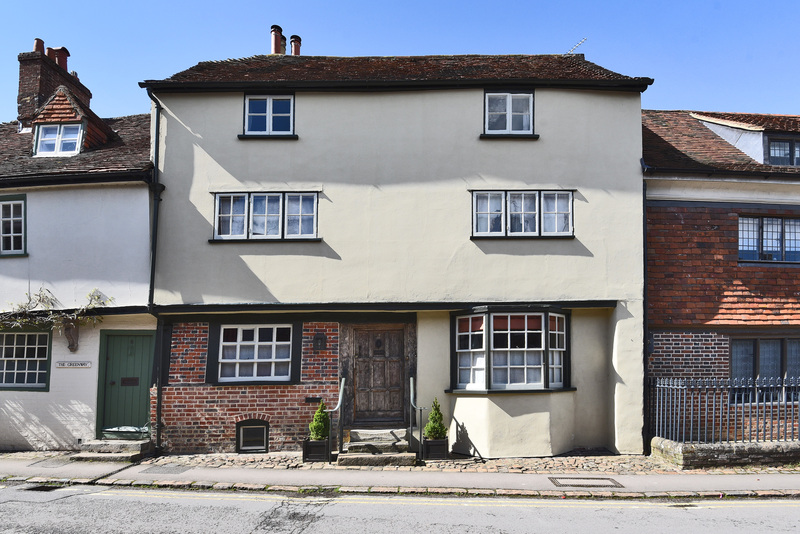 With 3 reception rooms, 4 bedrooms, 3 bathrooms and a beautiful sheltered garden to the rear of the house, it is an idyllic town house. Furthermore, having had time to enjoy the fruits of her labours the owner has been “bitten” by the restoration bug and relishes the opportunity of finding another property to rescue. For more information telephone 020 7664 6646.